The Trail Smoke Eaters used a six-goal 1st period and a season-high ten tallies to help them to their 20th victory of the season in a 10-3 win over the Salmon Arm Silverbacks on Saturday night at the Trail Memorial Centre. An offensive outburst in the opening period saw the Smoke Eaters tally a season-high six goals in the period, beginning at the 3:23 mark of the opening frame with a 5-on-3 power play marker. Tyler Ghirardosi tipped in a Trevor Zins slap shot from the right point for goals in back-to-back games for the Smoke Eaters forward and his 12th goal of the season and a 1-0 lead. Trail would score three goals in a 1:57 span beginning with Mack Byers tallying his 14th goal of the season at the 8:06 mark. The Smoke Eaters forward raced through the neutral zone and zipped a shot from the top of the slot past an unsuspecting blocker side of Silverbacks goaltender Ethan Langenegger to give the home side a 2-0 advantage. The Smoke Eaters continued their strong play just 1:16 later at the 9:18 mark of the opening frame as Max Kryski extended the Smoke Eaters lead to 3-0. Kryski threw a puck toward the net from the right face-off circle that glanced off a Silverback defender and past the glove side for his 4th goal of the season and a three-goal lead that saw Matthew Armitage come on to replace Langenegger in the Silverbacks goal. Just 42 seconds after that tally, Braeden Tuck put the first shot on Armitage past him on the blocker side on a rush from the right wing that resulted in the captain’s 12th goal of the season and increased the Smoke Eaters lead to 4-0. Tuck would be at it again at the 13:44 mark, extending the Trail lead to 5-0 courtesy of a power play marker. Tuck took a gorgeous feed from the left-wing off the stick of Chase Stevenson and corralled the puck in the right circle before beating Armitage over his glove side for his second of the night and a five-goal lead. Byers tallied his second of the frame to cap off the scoring in the opening period on a rebound as Ghirardosi made a great effort to get to the front of the net and force a puck on before Byers jumped on the rebound and slid the puck under the pad of Armitage to make it a 6-0 game heading into the 1st intermission. Matthew Verboon got the Silverbacks on the board with one of his three goals shorthanded at the 2:32 mark of the period before Kent Johnson dazzled the crowd with his 18th goal of the season and gave Trail a 7-1 lead. Johnson collected the puck behind the goal before cradling it on his forehand and stuffing it into the top of the net over the shoulders of Armitage for the lacrosse style tally and extended the lead to 7-1 at the 5:06 mark of the middle stanza. Ghirardosi earned his second goal of the night just 36 seconds later as the puck kicked out to him in the right face-off circle from a fray in the slot as he went to a knee to fire it into the empty goal on the power play to increase the lead to 8-1 at the 5:36 mark of the middle period of play. Verboon’s second goal of the game came on a power play at the 12:42 mark of the 2nd period before Ghirardosi capped off his hat-trick at the 15:21 mark with a shot from the left-wing past the blocker side of returning goaltender Ethan Langenegger to increase the Trail lead to 9-2. Kryski and Bryce Anderson teamed up for a shorthanded tally to push the score into double digits for the Smoke Eaters as Anderson raced down the right wing before sending a pass to the left side for Kryski to deposit his second goal of the season and a 10-2 lead. The ‘Backs finished the scoring in the 3rd period with Verboon completing a hat-trick of his own at the 7:29 mark but the Smoke Eaters finished with an impressive 10-3 victory on home ice. Donovan Buskey turned aside 29 of the 32 shots he faced in the game in his 2nd victory of the season while Ethan Langenegger started the game, stopping 17 of the 22 shots he faced in the game before Matthew Armitage turned aside 8 of the 13 shots thrown his way and was saddled with his 10th loss of the season. 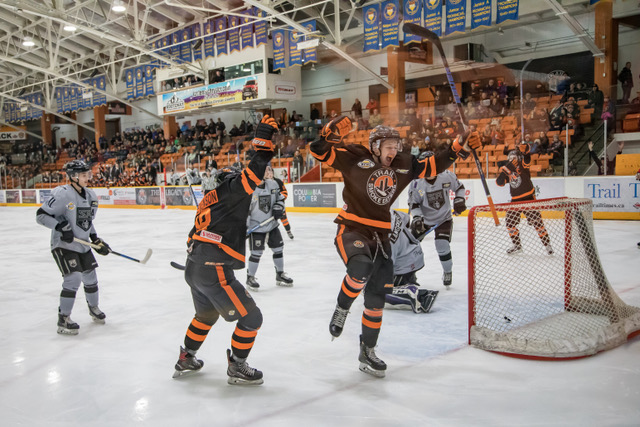 The Smoke Eaters (20-23-7-3) host their final Welcome Wednesday of the season when the Interior Division leading Penticton Vees (34-14-2-2) come to town in the team’s final game of the season series. Puck drop is slated for 7:00 PM on Wednesday night from the Trail Memorial Centre with tickets available at the Smoke Eaters Main Office as well as at the door ahead of the opening face-off.